For the longest time, we would associate getting sick with staying in a hospital for long periods of time. 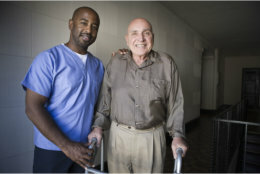 In the same way, we would also correlate growing older with having to move into a nursing home or senior care facility. However, at Hand in Hand Home Care Solutions, we see it differently and we want your family to see it in the same way. Hand in Hand Home Care Solutions offers Home Care in Florida through professional care services that are traditionally provided in assisted living or rehabilitation facilities. We bring these same services to the comforts of our clients’ homes. If you want to stay in your own residence as you retire or recover your health, Hand in Hand Home Care Solutions can make the necessary arrangements for that to be realized. If you need help with activities of daily living at home, please call 407-335-4676 immediately. We can arrange for a care coordinator to visit you and conduct a thorough evaluation of your eligibility for home care services.